Two years ago Brigitte Lardinois, a photographic historian resident in Lewes, approached Tom Reeves and Tania Osband with a proposal to map their archive, housed at the Edward Reeves Studio at no 159 High Street. Their business has been in continual operation since 1855 and is likely to be the oldest still working photographic studio, run by the same family at the same premises, in the world. 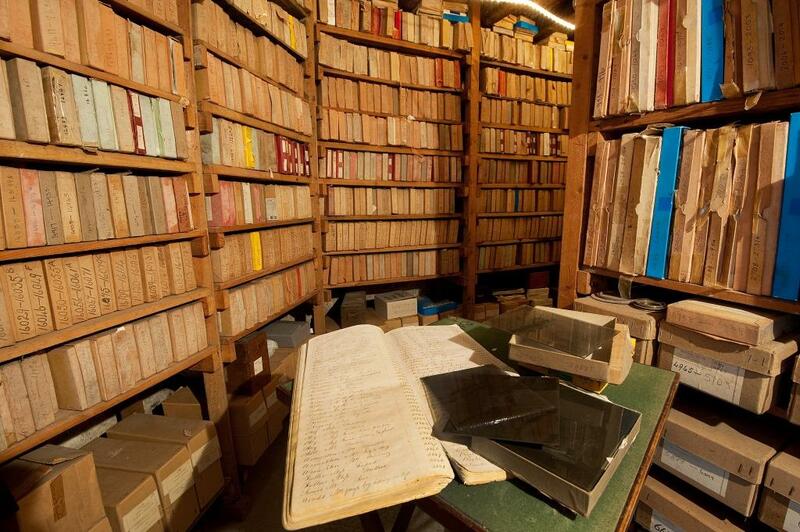 There are over 100,000 carefully numbered glass plates. 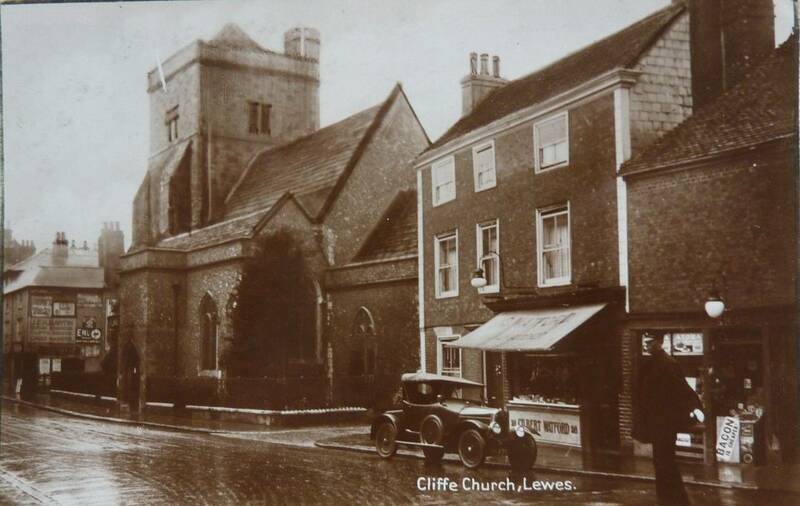 Brigitte will share with us her research strategy and discuss the plans for making this fantastic resource more accessible to those interested in Lewes history. Lewes Athletic Club are searching for trophies won by Tom Mantell, an outstanding Lewes athlete competing in the 1870s. Not only was he an outstanding athlete he was the driving force behind the establishment of the first Lewes athletic club in the 1880s. He was born in Lewes and lived at 161 High Street. He was the great nephew of Gideon Mantell the well known surgeon and geologist. Known as the Countryman, Tom Mantell competed and won running events in London and the surrounding area as well as Lewes. Between 1876 and 1888 he organised many athletic events at the Dripping Pan in Lewes, where teams from Oxford and Cambridge competed along with many athletes from the emerging South London athletic clubs that were being formed at that time. These were significantly big events, the biggest outside London, and were attended by the great and the good with military bands providing the music. Significant prizes were awarded that would be valued in many hundreds of pounds at today’s prices. One example is the five guineas prize won by local man Albert Banks which is worth around £300 at today’s prices. Albert was not only a local Lewes athlete but also was a newsagent with a shop in the Lewes High Street (see the cover of the book Victorian Lewes by Colin Brent and William Rector). Tom Mantell Tom was also a great character with typical Sussex characteristics with one example recorded where his stout independence came to the fore. Competing at a Bank Holiday athletic event at Camden Park, Chislehurst, in front of Empress Eugenie and the Prince Imperial he won all the athletic events from scratch. Asked which prize he wanted, he said all of them. Being told he could only have one, he said “OK, I will have none” This caused some consternation as the Empress was due to award the prizes and she therefore had no one to make the presentations to. This was solved by the Prince making a personal award to Tom of an expensive dressing case. Tom was also a coach to a number of other athletes including W G George, who was regarded as the finest runner in the world at that time, with a mile record set at Lillie Bridge in London. Tom’s training exploits were as dramatic as his competition wins. One of his favourite training sessions was to run as hard as he could down School Hill in Lewes. On one occasion a horse and cart came out of a side turning and with no time to stop Tom jumped over both. There was another occasion recorded where he jumped a double hedge with a five foot fence in between. He was also known to run from Newhaven to Lewes and in his own words ‘took’ anything that was in his way, in other words jumped hedges and ditches from Newhaven to Lewes. 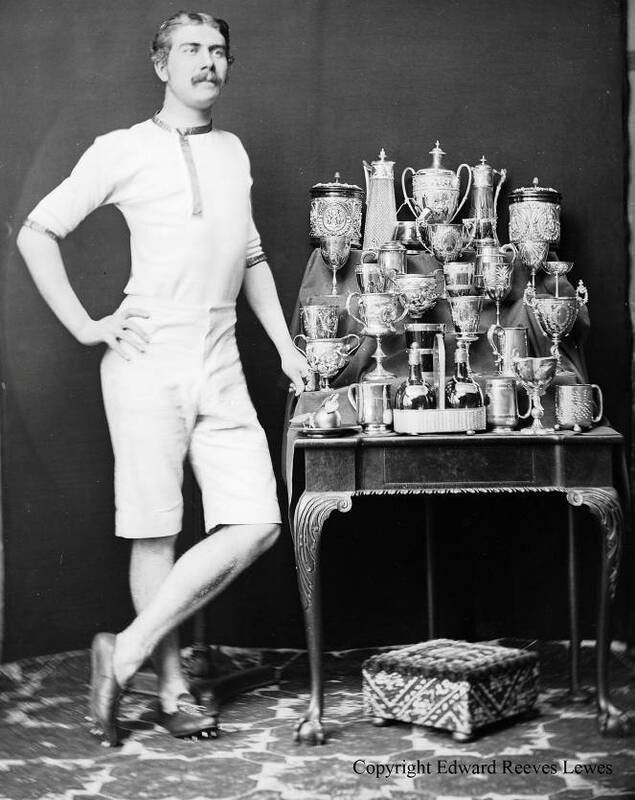 Tom won many magnificent prizes, as shown on the Edward Reeves photograph above. Tom being a bachelor, on his death in February 1924 he had no one to hand the trophies onto and bequeathed them to the then Lewes Borough Council. Having contacted both the Lewes District Council and the Lewes Town Council neither had any record of what happened to the trophies. However a visit to the Keep and a study of the minutes of the Borough Council’s Finance and General Purposes Committee revealed that the trophies were indeed offered in May 1924 to the Council by Messrs Isaac Vinall and Son Solicitors based in Lewes. The minutes also showed that the Council considered they had nowhere safe to keep the trophies, so declined the bequest. As Messrs Vinall and Son no longer exist, the trail has gone extremely cold. As the trophies are important historical items we are seeking any help or information that might lead us to the next stage in the search. If you have any such information please go to www.lewesac.co.uk and tell us what you know by using the contact form on the Club’s web site. Here’s hoping! 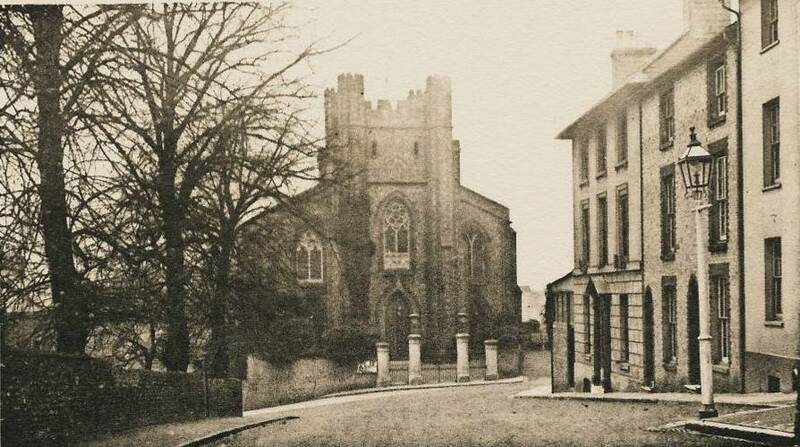 From the introduction of the New Poor Law in 1834 until the new Union Workhouse off De Montfort Road was opened in 1868 the Lewes Union used the former All Saints parish workhouse on St Nicholas Lane to house the Union’s elderly paupers. The 1861 census shows that the Union Workhouse Governor, Nicholas Rolfe, a Kent man, and his wife were responsible for a total of 55 inmates. Most of the inmates were in their 60s and 70s, with a handful in their 80s and a single widow aged 90. The Governor, aged 66, was older than quite a few of his charges. They included one married couple, and two or three married inmates without their spouses, but the great majority were widowed or single. The men were ascribed a wide range of occupations – a butler, a gentleman’s coachman, a blacksmith, a carriage smith, a bricklayer, a wheelwright, a tanner, a sawyer, a carrier, a butcher, a baker, a shoemaker, an ostler and an umbrella-mender, plus a selection of sailors and labourers. Where the women were given occupations, they were dressmakers or domestic servants. They seem a representative sample of the town’s occupations, with the common factor that through age or infirmity they were no longer able to support themselves. Two inmates in their 50s were described as ‘idiot’, one woman was blind and a young man of no occupation was infirm. In amongst the other inmates were three young women in their teens, and four more in their twenties, thirties or forties. One of these was accompanied by a new baby. These were presumably the care staff, who would otherwise have been in the Cliffe workhouse, used by the Union for its working-age poor. An item in the 3 March 1893 Sussex Express (provided by Hilary Smith) reported on the annual dinner at the Bear Hotel for the members of the Lewes Union Benefit Society, served by Mrs Whitcomb. The chair was taken by the treasurer, Mr Henry Card, and those present included Alderman Crosskey M.D. (the medical officer) and Mr G. Cripps (secretary). The balance sheet showed receipts of £46 15s 0d for the year, with expenditure of only £18 17s 3d. This had been a good year, with only £8 paid out to members who were sick. The balance was added to the accumulated fund, which increased to £376 13s 8d. Much of the evening was spent in complimentary toasts and harmony. 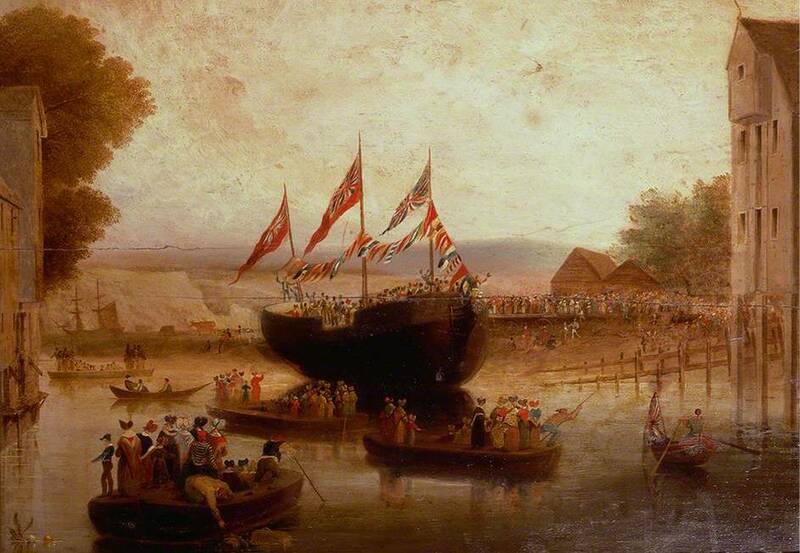 This painting in the collection of the National Maritime Museum, Greenwich, [Accession BHC3447] shows the launch of the brig ‘Lewes Castle’ onto the River Ouse, c.1839. The artist’s name is not known. This entry was posted in Art & Architectural History, Economic History, Education History, Family History, Lewes, Local History, Maritime & Naval History, Social History. Bookmark the permalink.